27% direct rakeback for USA p..
$1.3M High Five Tournament Se..
Free GOLD VIP status for life.. Rob Yong challenges Phil Hell..
ROFL thread with a "ROFL" in t..
Amazon paid $0 in federal inco..
Unofficial [New TV shows] thre.. I just joined a gym now what? BareKnuckle FC 5 Lobov vs Knig..
Best learning material for don..
New to LiquidPoker? Register here for free! SIT & GO JACKPOTS rebranded to "SPINS" with visual enhancements at PartyPoker. 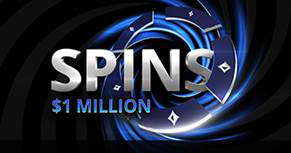 Partypoker is celebrating the launch of "SPINS" with special edition "SPINS $1M" games, giving players the chance to become a millionaire in minutes for a $5 buy-in. "SPINS" are a rebrand of the site's popular 3-handed "SIT & GO JACKPOT" tournaments, where players can win huge cash prizes for a relatively small buy-in. The "SPINS $1M" edition features a random multiplier between 2 and 240,000 that is applied before a card is dealt to determine the size of the eventual prizepool – meaning players could be contesting a prizepool of up to 240,000 times bigger than the actual buy-in. If the top tier multiplier is hit, players will find themselves vying for the first prize of $1M, while second and third place will both win $100,000. As part of the rebrand, the new SPINS games feature visual enhancements and enjoy a smoother animation. The table below illustrates the prizes that can be won in each $5 buy-in "SPINS $1M" game, which are all located under the "Spins" tab in the partypoker lobby. If you can please get back to me, that would be greatly appreciated.